Serve with: tortillas, rice, salsa, sour cream and cheese. Put everything in the crock pot and cook on low for 8 hours (or high for 4 hours). Shred the chicken (in the crock pot) and serve in tortillas with desired toppings. If you want to prep this ahead of time, take all the ingredients and put them in a ziploc bag. You can store it in the fridge overnight or freeze it for later. If you freeze it, just pull it out and let thaw overnight in the fridge before you put it all in the crock pot. 1. Dice the chicken and set aside. 2. In a small bowl, mix yogurt, honey and salsa. Add chicken and stir gently. 3. Cut the tomatoes in half and set aside. Put the lettuce in a medium bowl and sprinkle with the olive oil. Toss gently to coat the leaves with the oil. Sprinkle with the balsamic vinegar and toss again. 4. Top the lettuce with chicken and tomatoes and add the walnuts. Cut each breast in half. Place chicken in the bottom of a crock pot. Add ginger, green onion, coconut milk, turmeric, and pepper flakes. Cook on LOW for 4-5 hours. Turn the crock pot to HIGH. In a small bowl, mix cornstarch and water. Add pineapple and cornstarch mix to the crock pot and stir. Cook on High for 15 minutes. Serve over cooked rice and topped with peanuts. This was a wild idea dish stemming from the fact that I had asparagus that had to be eaten. I started off cooking some rice and knew I wanted chicken for dinner. So, I ended up throwing bacon into the mix for an unusual flavor combination that my husband absolutely loved. Cook rice according to directions. When done, set aside and keep warm. In the meantime. Add bacon to a large skillet and begin cooking. Add the chicken breasts on top of the bacon. Cover and cook for about 10 minutes turning the chicken and stirring the bacon occasionally. 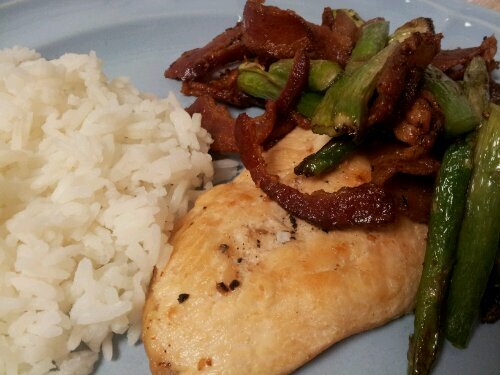 Once the bacon and chicken are nearly done, remove the cover and add the asparagus. Cook until the asparagus is tender. Serve with the rice. I always loved it when my mom made stir fry at home. She had a big red wok and it was the easiest way to get all of us kids to eat our veggies. I don’t have a big red wok and I did not have a large stock of vegetables on hand when I made this, but that didn’t make it taste any less awesome. Feel free to change up the veggies to suit your own tastes. My mom would use snap peas, and baby carrots, which I love! Saute cabbage in oil until tender, remove from pan and set aside. Add green beans and water chestnuts to pan. Season with soy sauce, garlic, and ginger. Saute until green beans are cooked yet still have some firmness to them. Remove from pan and set aside. Add chicken to the pan and cook until done. While the chicken is cooking, cook lo mein according to instructions on package. Once the chicken and lo mein are done cooking. Return everything to the pan. Stir well to combine and season with additional soy sauce or spices if desired. Keep everything moving quickly , and use plenty of oil, if you are not using a non-stick pan or wok. This simple dish packs some wonderful warm flavor. Mix 2 Tbs softened butter with curry paste, ginger and cloves in a small bowl. Melt 1 Tbs butter in a skillet and place the chicken in. Spread the spice mixture on top of the chicken and cover. Let cook for 5 minutes. Flip the chicken and cook, covered, for another 5 minutes. Flip the chicken again and let it cook until it’s done. This largely depends on the thickness of your chicken so if in doubt, use a thermometer.